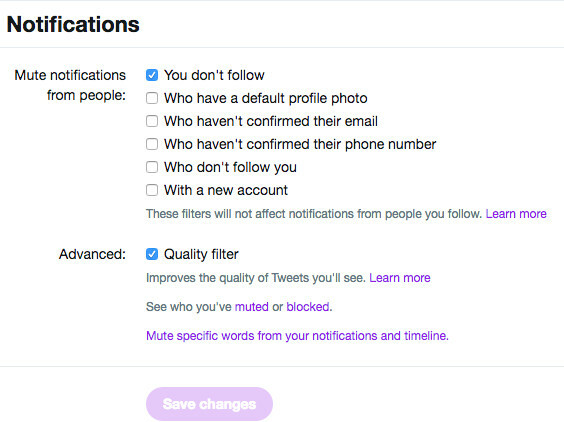 Today, Twitter has announced a new feature that allows you to mute notifications on accounts that don’t follow you, those that have a default profile picture, and those without a confirmed email address / phone number. To set the filters on the web browser version of Twitter, just go to Notifications, click on Settings, and check the boxes of your preferred filters. On iOS and Android, these filters can be found on the Notifications timeline under the gear icon. Unfortunately, there still isn’t a way to mass unfollow all the people who aren’t following you back. The company said that this is to prevent the potential abuse of mass unfollowing people. Today’s update won’t completely remove trolls and abusive behavior on the social media platform, but it will definitely help reduce the noise.